Grace Cathedral San Francisco is one of the most beautiful churches in the city. This ornately decorated Episcopalian Church is in the Nob Hill neighborhood. This French Gothic church is the third largest Episcopalian Church in the US. It also hosts thousands of visitors from around the world every year. This is the fourth Grace Church, which is now a cathedral since it is the seat of the Bishop. The original one was a small church built in 1849. Two larger churches were built over the years and the third one was destroyed in the 1906 earthquake. Shortly after the earthquake, the Crocker family - a wealthy banking and railroad family of San Francisco - donated some land for the church to rebuild. They began to rebuild in 1927. The structure and intricate details of the church were completed in 1964. My favorite part of the church is even before you step inside. 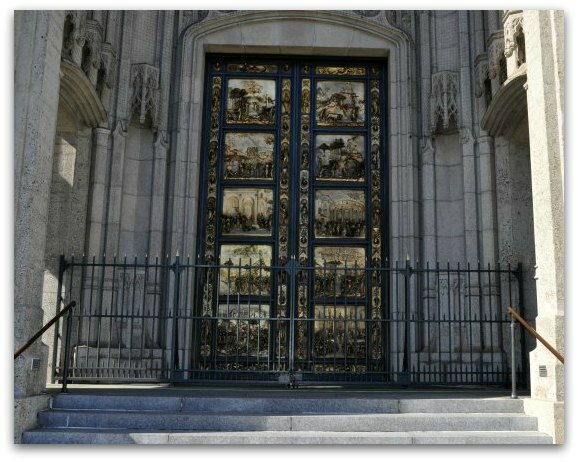 A blocked off entrance to the church features two beautiful doors called 'The Gates of Paradise'. 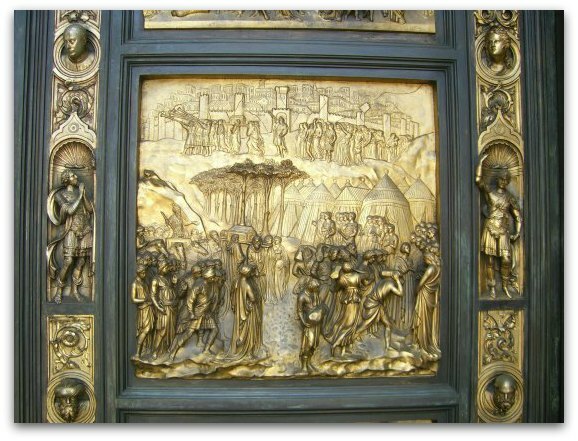 They are a replica of the doors made in Italy by the sculptor Lorenzo Ghiberti. The originals are at the Baptistery of the Duomo in Florence, Italy. They used the exact same molds to create these doors as they did in Italy. After they created this replica for Grace Cathedral, they threw the molds away. 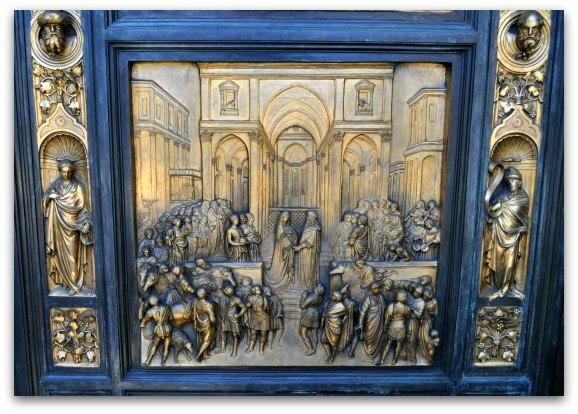 The doors are solid bronze. The sculptured pieces are covered with gold. Each panel represents a biblical event including Adam and Eve, Cain and Abel and Noah and his family. You can pick up a brochure inside if you want to know what event each panel represents. Here are a couple of close up shots of two of the panels. They do open the doors a few times a year, but only for large religious holidays. The gates in front protect them from the thousands of visitors that come to see the doors every year. Local Secret: If you want to get some great photos of the doors, come in the morning. This is when the morning sunlight hits them and illuminates them the best. You will also be in awe of the beauty on the inside of Grace Cathedral San Francisco. Inside you will find huge stained glass windows as well as other ornate details. Here are just a few highlights on the inside of the cathedral. 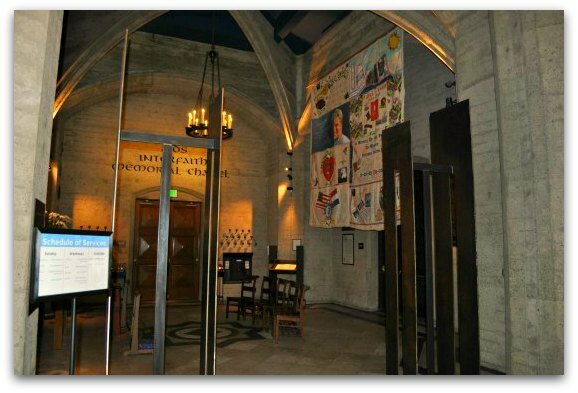 In the back of the church (on your right when you enter) is The Interfaith AIDS Memorial Chapel. This small chapel opened within the cathedral in 1995. It's a memorial for all of those that have died of AIDS. It's also a way to provide hope, compassion, and an understanding of AIDS on a global scale. 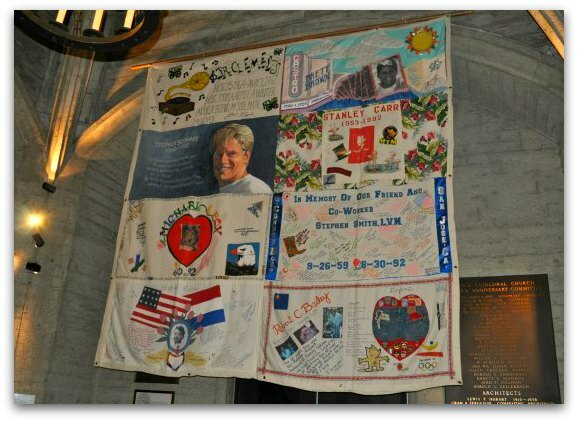 During your visit, make sure you also spend a few minutes looking at the AIDS Memorial Quilt. The quilt blocks are rotated frequently and represent the tens of thousands that have died from this terrible disease. Each block was made by a friend or relative to remember the life of their loved one that died from AIDS. The south wall of Grace Cathedral San Francisco has a number of colorful murals. These are on your left when you enter. They depict several important events in San Francisco's history including the 1906 earthquake and fire that destroyed the city (learn more). 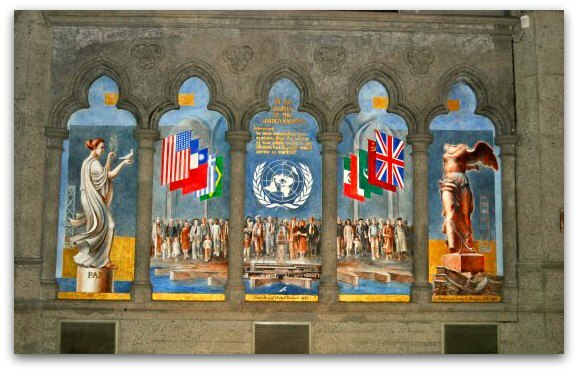 The one in the picture below shows the creation and signing of the United Nations, which occurred in the city in 1945. You will find a Labyrinth both inside and outside. 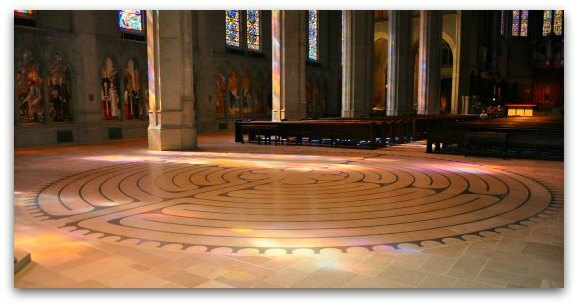 A Labyrinth is a divine imprint found in many religious locations throughout the world. The outside Labyrinth is open 24 hours a day. It's located at the top of the steps right in front of the cathedral. The inside Labyrinth is open during regular visiting hours. It's toward the back of the church, so you can't miss it. Grace Cathedral San Francisco welcomes people from all religions and backgrounds into their church for a visit. It is free to walk around. They do request a small donation so they can continue to maintain the church for both visitors and parishioners. They do not allow visitors to tour the church during their regularly scheduled masses. The times are posted outside the doors so you can quickly check them before entering for your visit. When you enter, make sure you pick up the free visitors guide. It includes a helpful map with locations of all the key features throughout the church. It also includes a little more information on the history of the church and the stories behind its key icons. 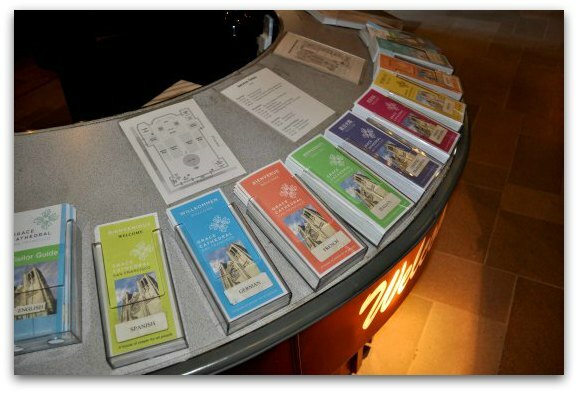 The table, shown above, with all the brochures is in the back of the church. If you want to learn even more, then head over during one of the church's free, docent led tours. The volunteer guided tours last around two hours and go into detail about the church. While they do run most days, they sometimes cancel the tours due to holidays or other church related events. You can also experience the cathedral in a different light by participating in one of their yoga classes. This is a free class given every Tuesday night on the inside Labyrinth at 6:15pm. As with their visits, they welcome everyone to their class. You will need to bring along your own yoga mat and supplies. They do allow water into the cathedral for the session, but no other food or drinks. You Might Also Like: There are a number of great things to do in the Nob Hill neighborhood. You can stop by the historic Fairmont Hotel, visit the Cable Car Museum or take a free guided walking tour. 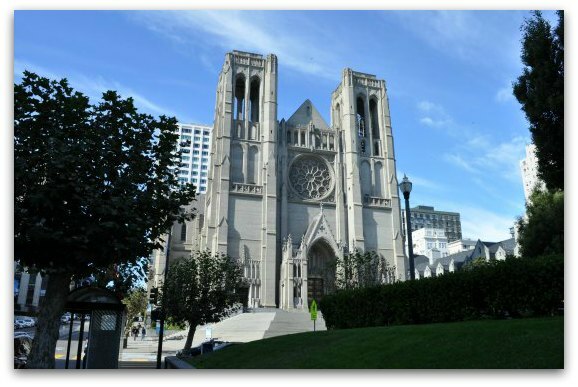 Discover more things to do near Grace Cathedral. If you are heading over on your own, your best bet is to take public transportation. The hill from Union Square or Chinatown is steep. Your best options are the 1 California (picks up every other block on Sacramento Street) or the California Cable Car line (several stops along California street). Both transportation options will drop you off less than one block from Grace Cathedral San Francisco. Each one takes about 10 to 15 minutes to get from the bottom of the hill up to the cathedral. If you plan on taking public transportation a lot (and visiting a few key museums), I recommend looking into the San Francisco CityPass. It includes seven days unlimited use of the San Francisco cable cars and public transportation. With this pass, you won't have to worry about digging for change or dollars each time you need to get to the next attraction. The pass also includes admission to some of the top San Francisco museums including the California Academy of Sciences (a MUST see! ), the Aquarium of the Bay (great for both kids and adults) and others. You will also receive a ticket for a San Francisco Bay Cruise. It's a great way to save a little money if you like to visit attractions and get around the city on your own.